Governments across the state are wrestling with a largely hidden fiscal crisis. It threatens to rob current and future generations of quality public services and weaken Oregon’s economic resilience. How can that be? State economic forecasts look rosy. Oregon is enjoying the second- longest economic expansion since World War II. Businesses are hiring. Incomes are rising. And the state is seeing record growth in tax revenues. But masked by the bright economic news is a dark reality for state agencies, schools and local governments: A structural deficit, resulting from rising pension and health care expenditures, will strain future budgets and harm our state’s ability to provide key services that are vital to Oregonians’ quality of life and prosperity. This crisis has long been the focus of business leaders in the state. In 2016, just weeks after a bruising ballot battle over a gross-receipts tax measure (Measure 97), partners in the Oregon Business Plan laid out their framework to address the state’s structural deficit. 1. Grow the economy. It’s the best way to generate more tax revenue, lift families out of poverty and reduce demand for social services. 2. Make structural reforms to slow the growth of costs that are rising faster than revenues. 3. Adjust the current tax code, including increases in business taxes, to generate more revenue for investment in areas such as early learning, high school and college completion, and workforce training. There are several causes for the state’s fiscal crisis, but none more concerning than skyrocketing PERS costs. PERS costs for taxpayers and public employers (including state agencies, schools and local governments) will double from $2 billion in 2015-2017 to $4 billion in 2019-2021, and reach more than $10 billion by 2029-2031. Those increased costs represent taxpayer dollars that won’t be invested in smaller class sizes, more instructional days, making college more affordable or upgrading infrastructure. RELATED STORY: Kate Brown on the road: Dogged by questions of leadership and a shaky relationship with business, the governor goes on tour to find out what employers want — and share her vision of a prosperous Oregon. The other big driver of the budget deficit is Oregon’s growing responsibility for funding Medicaid (the Oregon Health Plan). The Oregon Business Plan and its partners supported Oregon’s Medicaid expansion, and we still do. It provides health care to an additional 400,000 low-income Oregonians. Maintaining this coverage is critical to Oregon’s long-term prosperity. But as a state, we need to ensure that per-person costs are growing at a sustainable rate, and we need to find a way to pay for it. This year the Oregon Business Plan has been developing detailed proposals to address this hidden fiscal crisis for action in the 2019 Legislature. The plan will include spending and revenue reforms designed to increase investments in education, maintain Oregon’s Medicaid expansion, and meet other public needs vital to Oregon’s life and economy. Leaders from the Oregon Business Plan founding-partner organizations — the Oregon Business Council, Oregon Business & Industry and the Portland Business Alliance — along with numerous trade associations and local chambers have been meeting with community leaders to discuss the fiscal crisis and broaden support for addressing these challenges in the 2019 session. — Increase investments to improve high school graduation rates, keep college affordable, and meet other critical needs of our communities. 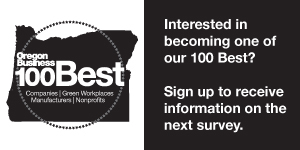 Throughout the year, Oregon Business Plan partners will be visiting communities across the state to meet with business leaders, legislators and candidates, school board members, local government officials, and other leaders to shape, refine, and seek support for policy proposals. Findings and policy recommendations from this process will be assembled in a plan to be presented at the December 3 Oregon Leadership Summit at the Convention Center in Portland. Allies and partners in policy development will then advocate for the proposals in the 2019 legislative session. Tackling these issues now, in good economic times, is far better than waiting for the next recession to decimate our schools and hurt our most vulnerable neighbors. It’s time to fix our broken fiscal system. Jeremy Rogers is vice president of the Oregon Business Council. He manages the Oregon Business Plan.